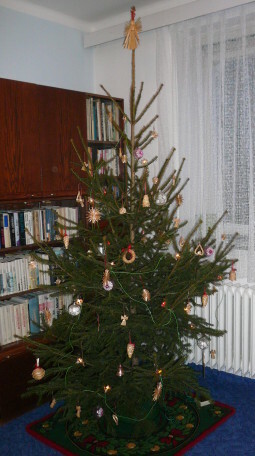 I wish merry Christmas, good luck and health, lot of presents and good mood to everyone! Happy new year 2009 . Yesterday at 9 o'clock I began my journey home with a train to Copenhagen central station. 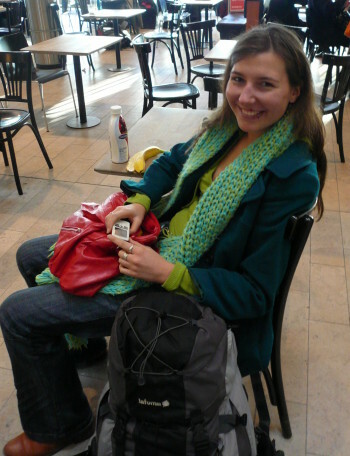 There I changed to the airport train and met my Slovakian friend Lucia and her brother. When we came to the airport and I saw the check-in queue, my first reaction was „WTF?“. They just served four flights at one counter. While I was waiting in the queue, I saw my neighbour Inese in the café. Another incredible meeting. And later when I finally checked-in, I met Kuba from EILC language course. We discovered we are on the same flight and also got the seats next to each other . It was really funny. My neighbour Inese at the airport. The funny mood went away a little bit when I did not find my baggage in Prague. I wonder when will it come, because I called to the airport today and they said they had no report from Copenhagen. But they „assured“ me that I am not the only one, total 30 baggages from my flight did not make it to Prague. Rest of the journey was pretty boring, just waiting two hours for the train and sleeping three hours inside it. Now I am just sitting at home, watching falling snowflakes outside and finally enjoying the Christmas time . Hurray, today I passed my English exam. I got 10 on the „strange“ Danish grade scale (from the best to worst mark it is 12, 10, 7, 4, 02, 00, –3 ), so something like B in the ECTS. It was the last thing this year, now I can start to notice that Christmas are coming. Both of the main pedestrian zones here in Odense are nicely lit by thousands of lights, shops are open even on Sunday and people are like crazy . This year I have to buy presents here, because I am going home on 23th of December. I think I will buy something typical Danish. Considering the prices here, I hope my wallet will not be completely empty after this. I have finally felt so sick of riding the piece of junk I own that I decided to buy something better as a Christmas gift for myself . 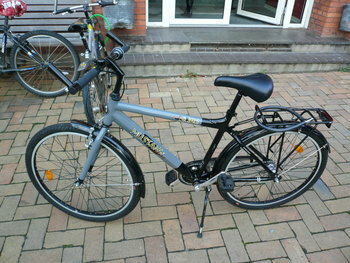 I bought one almost unused from my friend Megan, who was leaving home to USA and could not take the bike with her. I really like it, I can achieve the same speeds with half the effort and it does not make weird sounds while riding.